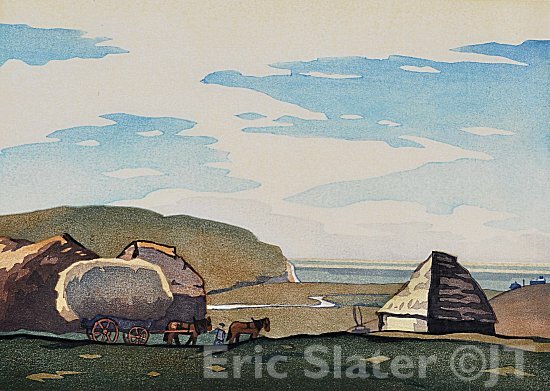 Although Slater produced about half a dozen floral woodcuts, most of his 36 or so prints are landscapes of scenes within a ten mile radius of his Seaford home. His work received an international audience thanks to some influential patrons and dealers. Campbell Dodgson, the keeper of prints and drawings at the British Museum, was perhaps his most important admirer. A noted academic and cousin of Lewis Carroll, Dodgson wrote an essay to accompany a print called the Stack Yard which had been commissioned by the Kansas Woodcut Society. The Stack Yard is typical Slater. In the foreground a horse drawn cart is bringing a crop to a yard where it will be stacked before being separated into grain and straw. Beyond, the river meanders towards the sea at Cuckmere Haven. The small figure is insignificant compared to the big sky and green landscape. The 1938 design, one of Slater's last, is bold, simple and pleasing to the eye. 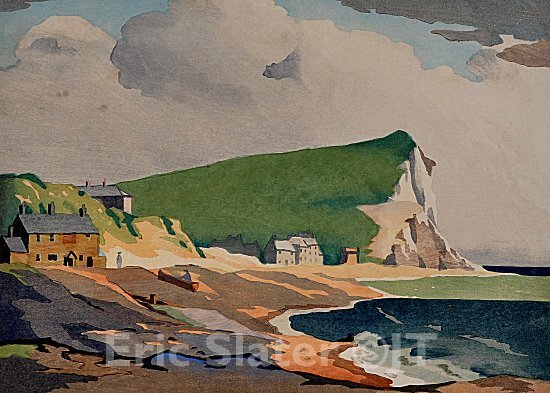 Eight years earlier, Slater produced a print of Seaford Head which won the gold medal in an international exhibition organised by the Society of Printmakers of California. 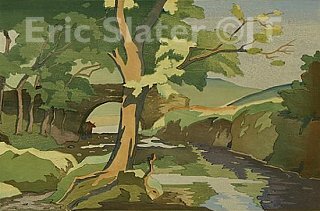 It was made using 10 woodblocks and has many of Slater's trademarks: a big sky, a palette of greens, purples, blues and browns and a strong design with small figures. Looking at it is rather like walking into a well proportioned room; you feel a rush of pleasure without immediately understanding why. 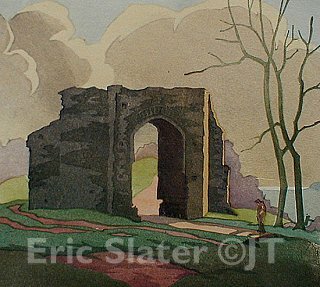 Slater is one of a small group of artists who borrowed Japanese woodcut techniques to create a very English feel. As Japan opened up to the West towards the end of the 19th century there was an exchange of ideas which enriched both traditions. 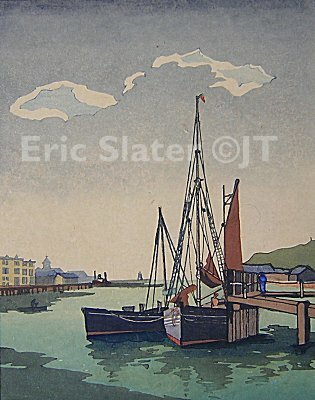 The first Western colour woodcuts made in the Japanese style date from the 1890s, Slater was in the second wave of a group of English colour woodcut artists who were producing affordable art up until the Second World War. Afterwards fashions changed and many printers favoured other methods such as linocuts, lithographs and screenprints.